The Swiss-based Bank for International Settlements (BIS) released its latest annual report and warned there could be a “quick and sharp” reversal of fortune of the world’s debt when markets come home to roost. Talk about being in firm command of the obvious!!? Economists and public officials will tell you otherwise, of course. The banks are safer now, they say, “because of higher capital ratios” and revised reserve requirements intended to keep the world’s financial system in one piece. That’s the official story. What they’re not telling you is that the risks have been very methodically and very deliberately shifted to individual investors, pension funds, and insurance companies – a move I told Money Morning readers was coming more than a decade ago, long before Total Wealth existed and many times since. It’s scary stuff and, to be clear, I am NOT trying to ruin your day. Again, the powers that be – meaning the more than 160 central banks in on the “con” – will tell you that this isn’t a big deal. That they’ve got the situation under control. Global debt now stands at 217% of worldwide GDP versus only 179% on the eve of the Financial Crisis, and the vast majority of that is a byproduct of emerging markets that have also fallen for the illusion that they can borrow their way to prosperity. It makes me madder than a proverbial hornet because things don’t have to be this way – but that’s a story for another time. What matters right now, at this very moment, is how you handle the breakdown that’s headed our way. Again, I want to be very clear. Government apparatchiks think they have this covered and, as long as they can maintain the illusion, that’s true. This is why central bankers, including the U.S. Federal Reserve, are trying to slow the rise of interest rates worldwide. They’ve got to build up the financial buffer needed to guard against the next crash. Structurally speaking, what central bankers are trying to do is impossible. That’s because the financial leakage associated with derivatives and other exotic trading instruments that led to the last crash – including swaps, structured contracts and, of course, mortgage debt – is still with us as a byproduct of quantitative easing and artificially low interest rates. The world’s central bankers are simply lurching from crisis to crisis under the guise of managing their respective currencies and financial markets. They’re not in control, despite the fact they desperately want you believe otherwise. The U.S. dollar is the linchpin, and I say that because the Federal Reserve is dramatically out of sync with the world’s other central bankers. The E.U., for example, is still trying to get its head around how to exist in an era of easy money, while Japan is still maintaining its simulative tilt. Jerome Powell, the recently seated Chairman of the Federal Reserve, isn’t helping by maintaining a hawkish tone, making the U.S. dollar more expensive by raising rates at a time when other central bankers – who collectively control nearly 75% of official currency reserves – aren’t on board. As long as the increase is gradual, the markets can adapt by shifting money between markets and investments – a point I’ve made repeatedly on national news appearances over the past few years. But, all bets are off if there’s a spike. That’s the real risk here and, ironically, the one thing central bankers and policy wonks cannot control, no matter how much they’d like to. Bond traders actually run things. They’re tasked with trading trillions of dollars a day in real money – not policy level pronunciations – and are actually the ones in control. Their world is one of black and white, which is why they’re focused with laser-like intensity on hedging exposure to increasingly costly pools of liquidity. That’s also why they’ll start fighting with each other the way predators fight with each other around a water hole in the desert that’s drying up. I have to believe that banks know what’s coming, and they’re scared stiff. This is where the proverbial rubber meets the road. The BIS report, you see, shows very clearly that the world’s biggest banks are using repurchase agreements – repos in Wall Street – to disguise artificially and bring leverage ratios in line just in time for quarterly reporting and stress tests. In other words, they’re gaming the system every time they’re up for inspection. This is like a five year who knows a bed check’s coming because of the sound his or her parents make on the stairs before they open the door. You know what happens next – we’ve talked about this many times. Capitalism by its very definition includes success and failure. History is littered with the bones of failed companies and the pure fantasy, all-gain, no-pain recovery that the financial alchemists have created will ultimately end badly. Believe it or not, that’s actually good news because this is one of the very few specific instances where you, as an individual investor, have a distinct advantage. First, you’ve got to squeeze every last cent of profits out of the system before it retrenches. Big Wall Street traders can’t disguise what they’re doing. They can’t pick up a few hundred thousand shares of Microsoft Corp. (NasdaqGS:MSFT) without the world noticing, for example. But you can move in and out of almost any stock you please without moving the needle. This translates into better pricing for you, narrower spreads, and bigger profit potential. Some of my favorite Total Wealth Tactics at the moment include the Lowball Order, Profit Targets, and the Free Trade to keep risk to razor thin levels. Again, at the risk of sounding like a broken record, you’re not alone if your first instinct is to run for the hills – but that is exactly the wrong thing to do. The final gasp of any bull market is based on optimism and unprecedented buying, and as long as earnings and the broader economy are strong, that’s a bet you have to take because the risk of getting left behind is too expensive. Your job is to go along for the ride until the market gives you a reason not to. In case you’re wondering “when,” like a lot of folks are, I think Q1 and Q2 earnings are probably baked in; it’s a quarter or two from now that I worry about, because that’s when expectations will get harder to meet. Second, you want to prepare ahead of time for the downdraft. Most investors will fail to do this and, unfortunately, pay a terrible price for thinking they’ll deal with the chaos when it hits and they have to make decisions in the heat of the moment. Again, you don’t want to run for the hills. 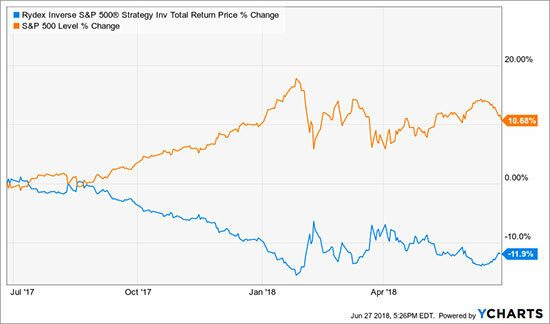 Your best course of action is to begin edging into specialized inverse funds like the Rydex Inverse S&P 500 (Nasdaq:RYURX), or its ETF cousin, the ProShares Short S&P500 (NYSEArca:SH) while they are inexpensive and everyone is looking the other direction. Both rise as the S&P 500 falls so having exposure to one or both of these choices will take the sting out of any sudden drop. More advanced and aggressive investors could also use options and spread trades, but we’ll save that discussion for another time or one of my upcoming presentations in Las Vegas, New Orleans, or even Miami (which I’ll tell you about in due course). And, third, you want to get ready to buy. The world’s best investors go bargain hunting during periods of market madness. Sir John Templeton, for example, became fabulously wealthy by buying at points of maximum pessimism. The legendary Jim Rogers, ditto. None of these men get caught up in the hype that inevitably surfaces when the you know what hits the fan. Need a another fund like RYURX. Are there other opportunities besides the funds?